I was a bit confused at first because, in fact, I was not bringing queso dip. She meant one of the other Nicks… turns out there are many Nicks in her family. “I’ll believe that when I taste it,” I huffed. Later that night, after I consumed a few truckloads of said dip, I agreed with her. 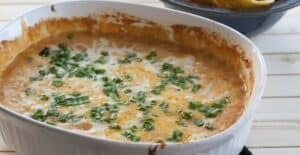 I adapted the original recipe a bit, but it’s still super easy and makes for a very tasty Baked Queso Dip! 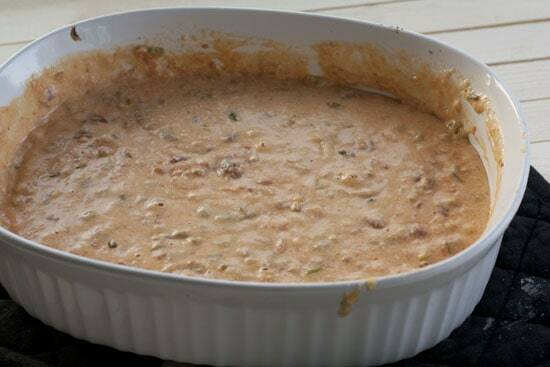 Simple baked queso dip recipe that will disappear at your next party! 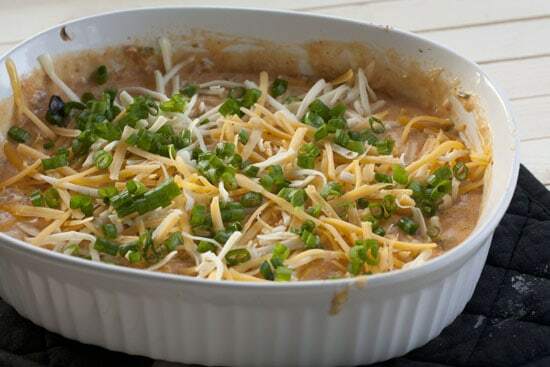 Easy to stir together with layers of pinto beans and cheddar cheese. 1) Chop four full scallions. In a large skillet, melt butter over medium heat. Then add drained beans, chile peppers, and scallions. Season with a pinch of salt. 2) Cook over medium heat for 4-5 minutes. Gently mash beans with the back of a spoon. The mixture doesn’t need to be completely smooth. 3) In a small bowl, stir together taco seasoning, hot sauce, and yogurt. 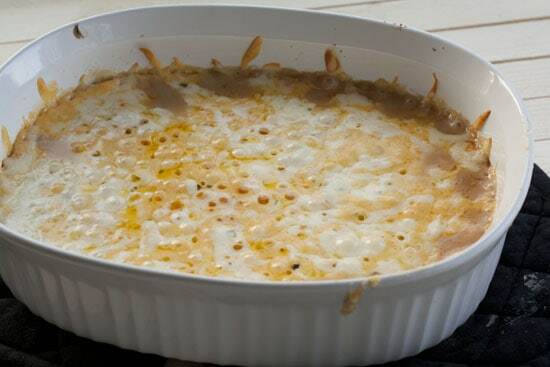 4) In a large baking dish, spoon in bean mixture followed by the yogurt and hot sauce mixture. Spread it evenly over the beans. 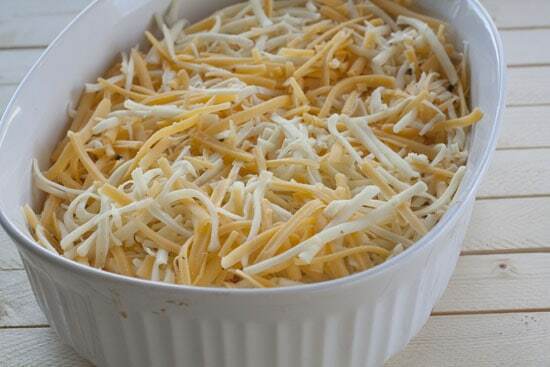 Top with about 1 pound of grated cheese, but leave 1 cup of cheese for the topping. I like to use a mixture of cheddar and monterey jack. 5) Bake dish for 30 minutes at 350 degrees. 6) Stir dip well to mix layers and ingredients. Top with reserved cheese and two chopped scallions (just greens). 7) Return to oven and bake for 15 minutes. 8) Serve immediately with tortilla chips! There are three basic layers to this dip. The original recipe just uses a can of refried beans, which was very delicious, but I took the opportunity to inject a bit more flavor. 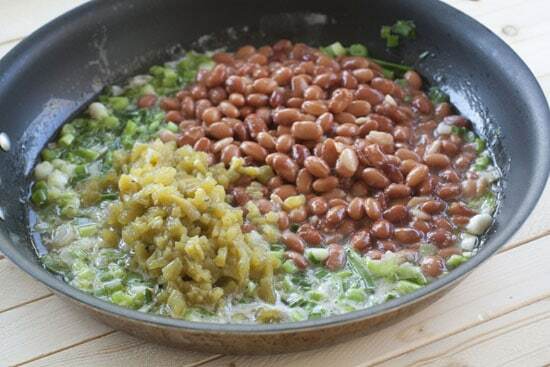 Melt the butter in a large skillet and then add the drained beans, green chiles, and scallions. Season it with a pinch of salt. 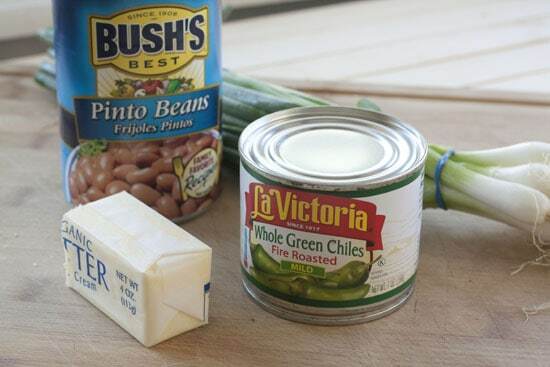 Cook this mixture over medium heat and as it cooks, mash the pinto beans with a large spoon. There’s no need to make it completely creamy. Some texture is a good thing! Cook and mash it for about 4-5 minutes. No need to completely mash them. The other two layers for the dip are pretty simple. One is just sour cream or Greek yogurt (I used yogurt) mixed with taco sauce and hot sauce. The third layer is just about a pound of grated cheese. I used a mix of cheddar and monterey jack. 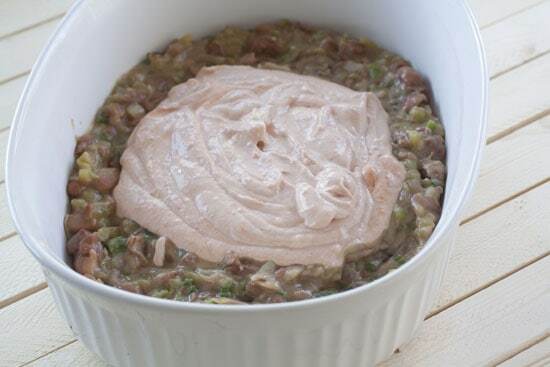 To make the dip, pour the bean mixture into a large casserole dish. I used a nice 2.5 quart dish, but any large baking dish will do the trick. Then spoon your yogurt or sour cream mixture over the beans. 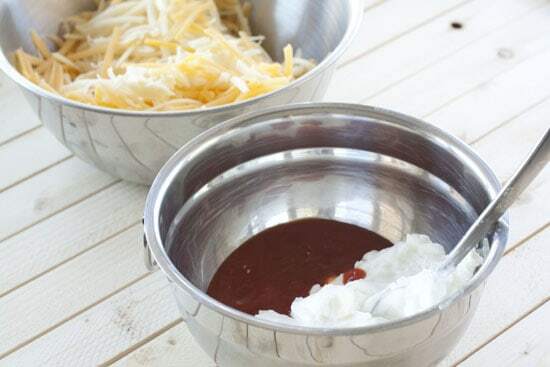 Once the yogurt mixture is spread evenly, go ahead and top with the grated cheese. Reserve about 1 cup of grated cheese for later, but otherwise just pile it on! Bake this whole thing at 350 degrees for about 30 minutes. It should be bubbly and melted. Now for the key part… stir the dip together! Really stir it together well so all the layers mingle. It should look something like this! While this is delicious, we can pretty it up a bit for serving. So add the reserved grated cheese to the top along with the extra scallion greens. Stick this back in the oven for 10-15 minutes to melt the top cheese and then you are ready to rock. Serve this as soon as possible with lots of tortilla chips! I really like the extra cheese topping. You get this solid cheese layer and then a creamy dip underneath. I will admit that Betsy and I basically ate just this Baked Queso Dip for dinner one night. Well, actually, it took us two nights to finish it off. I think that should be evidence enough that it’s a pretty awesome dip! We’re having a party Saturday night and may need to make this! I’d never really had queso before moving to TX, but its definitely a staple here! Looks perfect for a party! Mmmmm! Thanks for the idea! 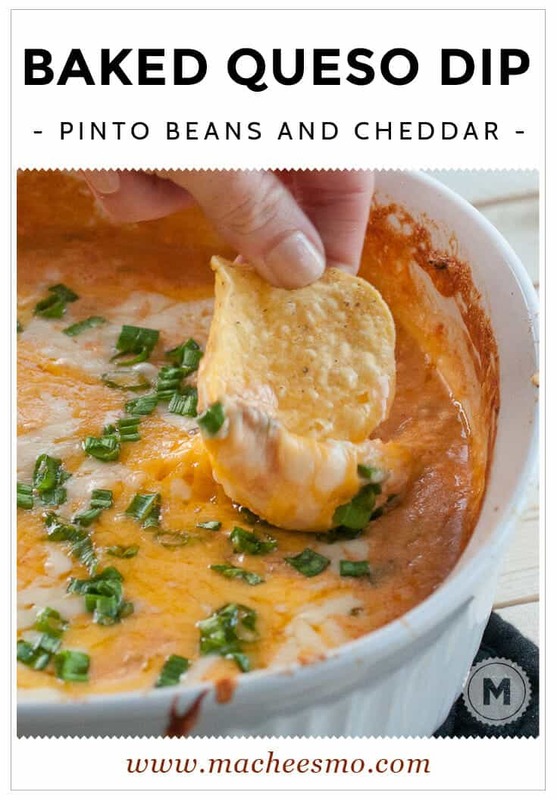 This looks great – love thats is a queso recipe without processed cheese. 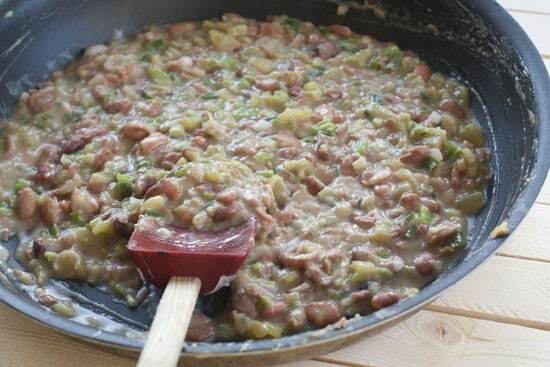 I just cooked up a batch of pinto beans will definately have to try this weekend!! I definitely want to try making this, but I’m not familiar with bottled taco sauce. What exactly is it? What brand do you use? Would it be similar to perhaps a homemade enchilada sauce? I grabbed it in the latino section of my grocery store… it literally just says taco sauce. You could use homemade sauce or even a medium/mild salsa would do the trick. I keep wondering who won yesterday. Has it been announced? If it has and I can’t find it, I apologize. Just in time for tailgating season. You could assemble this at home and then grill it at the game. Made this last night for my husband’s game night with guys and they raved over it. One guy swore he tasted bacon in it. (I cooked the beans, chilies, onions, butter in my cast iron skillet, so that’s the only thing I could think of?) But bacon or not, it was a hit. I know it will be requested again. Thanks! I made this tonight for a party and the flavor was awesome, but the texture was pretty strange – very grainy and greasy. It reminded me of when a cheese sauce breaks. Any ideas where I went wrong? I think the problem was with the greek yogurt or the cheese I used? I will be making this again because the flavor was great, but I will use sour cream instead of the yogurt. Hey Kristen, did you use greek yogurt or regular yogurt?